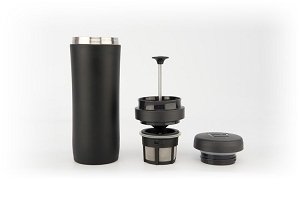 The Travel Coffee Press by Espro is a travel version of their incredibly popular Espro French Press. The two patent-pending filters are 9-12 times finer than a common French Press. They get beneath the grinds and filter twice, leaving all of the flavour and none of the grit. The Espro Travel Press is the perfect 12 oz size, and fits comfortably in your bag, cup holder, or bike bottle cage. A double lid with silicone seals keeps your drink safe while you navigate the urban-jungle. The stainless steel vacuum insulated double walls keep the outside cool and the inside hot (or the other way around for iced tea and cold brew coffee). Dishwasher safe.